I have nurseries on my mind for a couple of reasons. 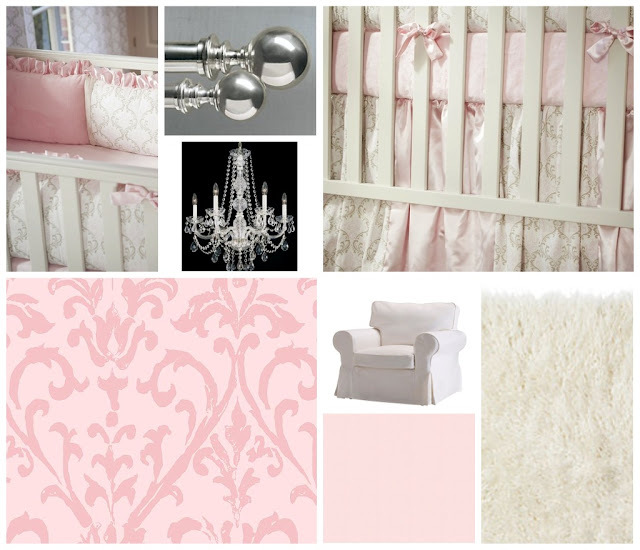 One, I am designing a nursery for a client ... and two, my daughter is having a baby next month. Both babies are girls and I have had more fun playing around with ideas for them. When I first started working on my client's nursery, all she told me was that she wanted a lot of pink. So I sent her an idea board to see what she thought. 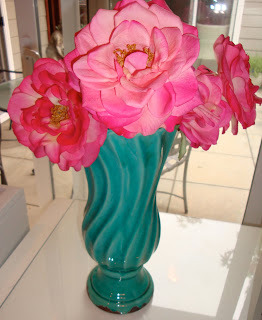 I based it on colors we had used in decorating her home previously and I thought she would probably want something modern and young. I also sent her four nursery ideas to see which one resonated with her the most to try to get into her head a little bit. (All nursery images were found here). 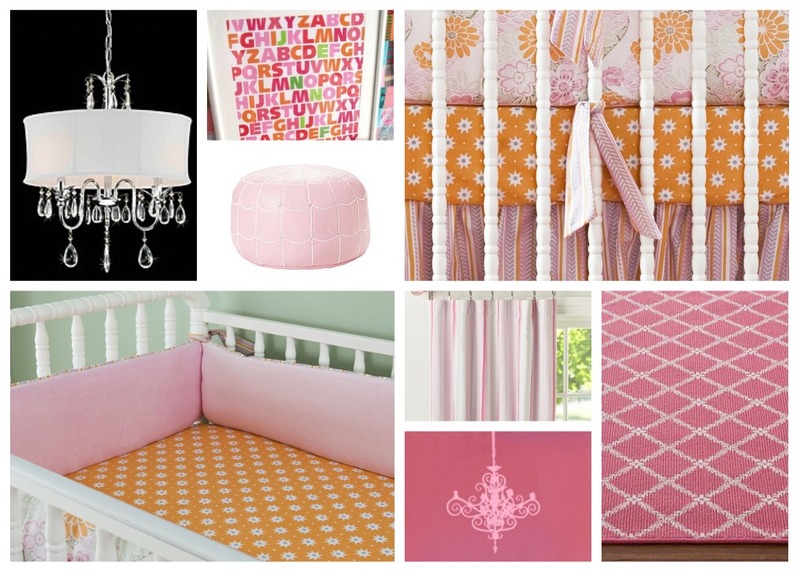 In contrast, my daughter wants her nursery to be much brighter and she is shying away from soft pink. Her inspiration was a vase of flowers that I had put in her sister's room where she stays while she is with us. A client of mine gave us her beautiful Bellini crib that her three daughters had outgrown. We were thrilled. My painter offered to paint the crib the color my daughter chose, Tropical Teal 734 by Benjamin Moore. 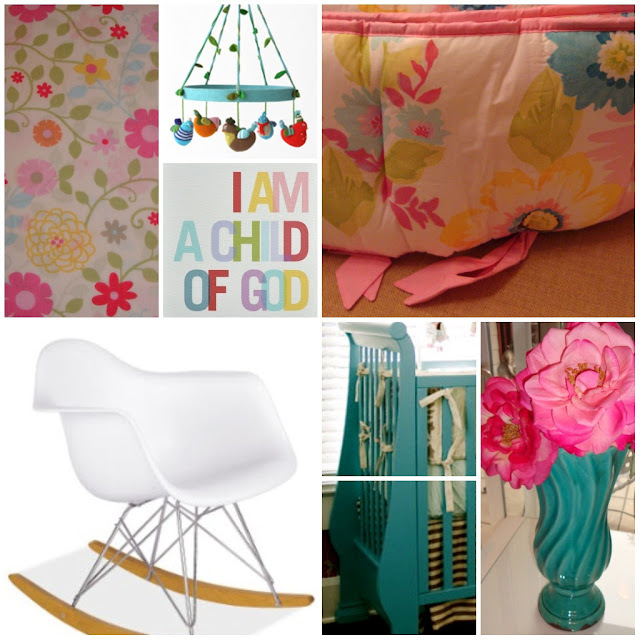 I can hardly wait to see both nurseries completed (and the sweet little girls to arrive!). I love soft and tradicional! Hi Amy, I LOVE her Suzani and Ikat fabrics for crib bedding. If I just had one more room in my house I would be making a nursery for this new little girl in my house too and her fabrics would be a top contender! All so pretty! Cannot wait to see how they turn out! I, too, am expecting a granddaaughter in December and cannot wait. We are working on her nursery right now. This is great inspiration. Cant wait for you to show pics of that beautiful crib occupied! I really like both choices. So nice to see them in one post! I like the black and white as well... something to think about!!! SUCH an excited time. Love how you are painting the crib. All so lovely. Some of your photos did not show up...is it just my computer?